American Tower Clock Company is located in Rochester NY, and has been a family owned business for 25 years. Additionally, American Tower Clock Company is a certified government contractor. They recently won a bid to refurbish and repair the wall clock located in the main lobby of the Old Faithful Inn located in Yellowstone National Park. They are completing this job for the National Park Service. The clock was originally installed in 1904 when the Old Faithful Inn opened. The clock resides in the main lobby of the inn. To this day the Old Faithful Inn remains the largest log structure in the world at 6 stories in height, and is an attraction to 3 million visitors a year. For this job Mike Kuyt and Dave Kuyt (a father and son team) traveled to the Old Faithful Inn in Yellowstone National Park, to disassemble the clock and bring it back to Rochester NY to be refurbished and repaired. The clock is wall mounted and stands 16ft in height. Needless to say, bringing it back to Rochester NY was not a quick or easy task. Once here, Mike and Dave have been working overtime to get this piece of American heritage back to new and working condition. This required a lengthy process of refurbishing which included creating a CAD drawing set of all the existing parts of the clock. Finnovation Product Development was able to assist in the task of creating 3D CAD models and 2D CAD technical drawings using the capabilities of Autodesk Inventor. 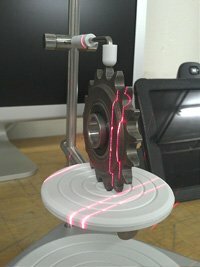 The clocks mechanical parts were reverse engineered using precision measuring equipment including a 3D laser scanner. The CAD files were then arranged to meet the requirements of the job as laid out by the Park Service. 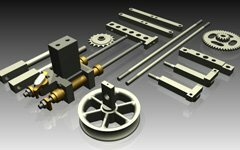 The 2D technical drawings and 3D virtual models can be easily revised for engineering and design changes if need be. Additionally, the CAD data can be used for full part manufacturing in the event a part needs to be replaced. 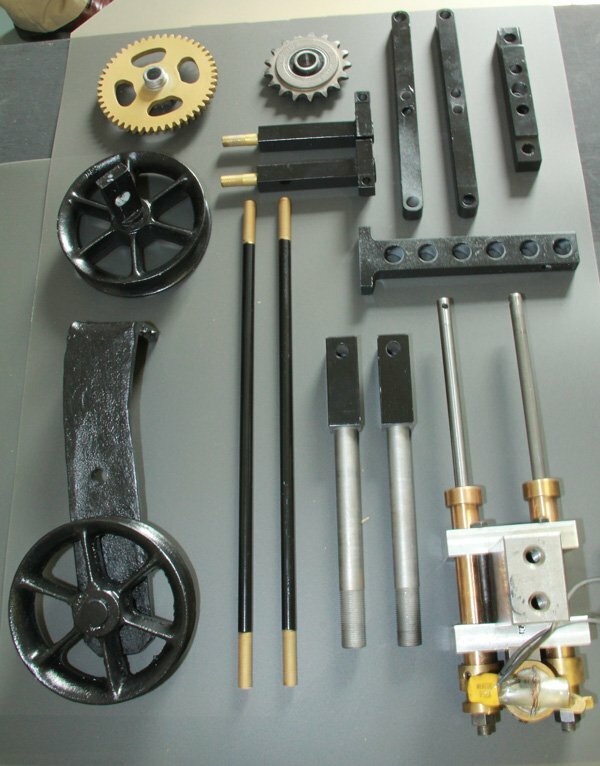 3D CAD models will never wear out and can easily be manufactured by a number of process' including 3D Printing. 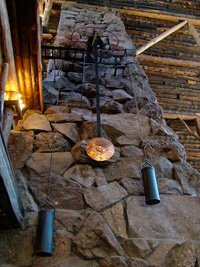 Imagine being able to purchase a scaled down version of the Old Faithful Inn clock for your home. This could easily be achieved now that 3D CAD models exist. 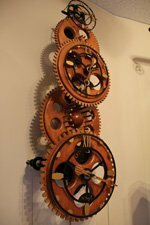 Speaking of wall clocks for the home, Mike Kuyt also creates mechanical art sculpture in the form of open gear wall clocks. State Representative Ron Paul even has one! His work represents master craftsmanship coupled with ingenuity in engineering. 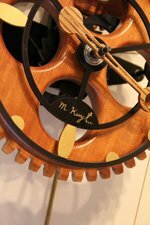 Simply put, Mike's Clocks are " The world’s most accurate and reliable wooden gear clock, accurate to within 1 second per day." Recently Mike was commissioned to do an installation of a 12ft tall tower clock art sculpture. This sculpture can be seen at Artisan Works located in Rochester NY as well as many other of Mike's original designs.